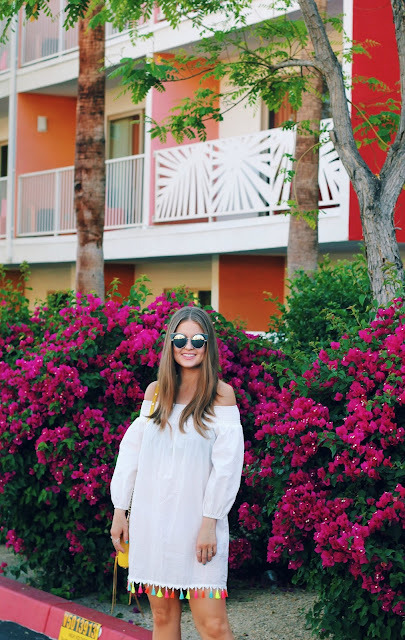 I had to wear this rainbow tasseled off the shoulder dress at the Saguaro Palm Springs to match the scenery. How cute is it?! It would be the perfect beach or pool swimsuit cover up. It's very lightweight and sheer, so if you're wearing it alone definitely wear a slip underneath. Or you could easily throw a jean jacket over it and wear it for a night on the town! I just think the rainbow tassels are the cutest! I hope everyone has a fun weekend! Thanks so much for stopping by! This dress is so fun! Love the multi color tassles! Super cute tassels on that hemline! 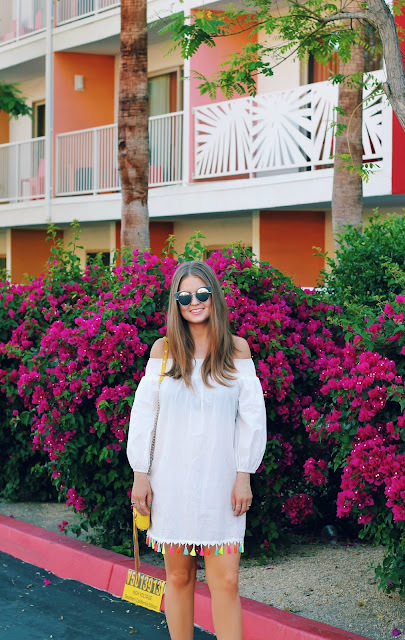 I love a LWD for summer but the tassels up the cuteness factor on this one!